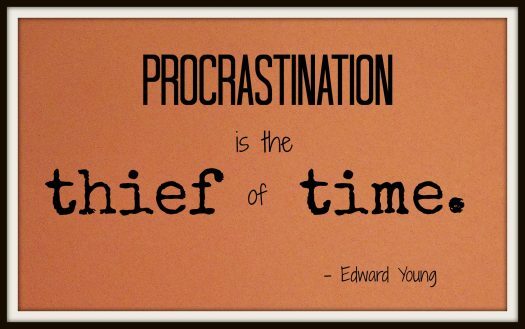 Everyone faces procrastination at one point or another. For as long as we can remember, we have been struggling with delaying and avoiding things that matter to us. Procrastination is the act of delaying or postponing a task or set of tasks.It is really the force that prevents you from following through with what you had planned on doing. During the most productive moments, when we temporarily remember how to not procrastinate, we feel satisfied and accomplished. A great way to not feel the need to procrastinate is to make you tasks more achievable. For example, when writing an essay for English. Make a mini goal, write 100 words per day if the assignment is due on Friday and you need 500 words take about 20 minutes per day to write as many as 100 words. A great way to get things you need done is to write a list. Its best if you limit yourself to no more than 6 tasks per day. Only look at task number one do not start another task until you finish the first one. If you find it hard to complete that many tasks per day then cut you list to 4 or 5 each day. Small measures of progress help to maintain momentum over the long run which means you are more likely to finish large tasks. The faster you complete a larger task, the more quickly your day develops an attitude of productivity and effectiveness. The biggest hurdle to finishing tasks is starting them. Always remember how great it feels to accomplish daily tasks.